On 29 June 1963 Limerick welcomed America's first citizen, 46 year old President John Fitzgerald Kennedy as part of his Irish tour which took in Dublin, Wexford, Cork and Galway. Limerick's inclusion was a last minute change after much civic campaigning focusing on the fact that the President had ancestry from Bruff, Co.Limerick. Greenpark racecourse held a gathering of thousands of people to witness JFK become a Freeman of Limerick. The city came to a standstill with local businesses closing between the hours of 12 noon and 3pm. Only five months later the young, glamorous American which we called our own in Limerick was assassinated. Limerick was quick off the mark in Ireland wishing to commemorate JFK's historic visit. With plans underway for a new boys school for the Ennis Road area of Limerick, St Munchin's Parish priest Monsignor Michael Moloney suggested that it should be named John F. Kennedy Memorial School (Personal conversation with Barry Sheppard, QS for JFK, December 2010). It was the first school in the country to be dedicated as a memorial to the late President. 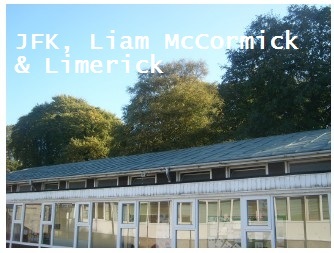 Many buildings in Ireland in the coming year were named in honour of the American president such as the JFK Memorial Hall in Dublin. 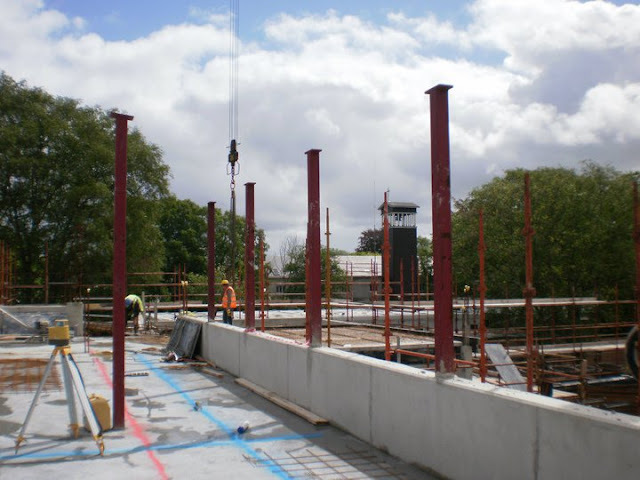 It was decided to erect the school on the same site as the Holy Rosary church to accommodate 350 pupils. Monsignor Moloney approach the same architect as the church, Liam McCormick fifteen years after he first approached McCormick and Frank Corr to design the church after they won the competition to design the Church of Our Lady & St Michael. It was not the first school that Corr & McCormick designed- that was St Malachy's Primary School in Coleraine. Logistically the distance of the practice in Derry from Limerick made it difficult with Corr only visiting the site once during its construction. Sadly Monsignor Moloney died in a tragic car accident in October 1964, not living long enough to see the school completed. JFK Memorial School was formally opened on Wednesday 4th May 1966 by the Minister for Education E.S. O'Murcheartaigh, Deputy Chief Inspector Department of Education and the Bishop of Limerick ('Historic occasion in Limerick; three schools opened, 4 May 1966, Limerick Leader). Flying above the school were the tri-colour, the Papal flag and the stars and stripes. JFK's sister, Jean Kennedy Smith, United States Ambassador to Ireland visited the school in 1995. Corr & McCormick came up with a design for a simple one-storey school which formed a courtyard, a private space. Its materials echoed that of the church with the darkly stained exterior weatherboard contrasting with the gorgeous green of the copper roof. The front elevation towards the Ennis Road made maximum use of natural light with its continuous fenestration. Unfortunately the weatherboard was not regularly painted and treated so over time it did deteriorate with substantial pieces falling away. The window and door frames were timber throughout the school before the insertion of uPVC windows in recent years. The school was conceived and always seen as a temporary measure. Not able to keep up with changes in the Irish education system, cloakrooms and toilets were turned into language support room and three temporary classrooms were erected facilitate growing student numbers. The school received government funding in 2005 for the construction of a new school on the site. After a structural survey it was deemed that none of the building was salvageable including its copper roof. The inspector's report stated 'I consider the demolition of the existing school to be accepted as it is of little architectural merit.' An Bord Planála approved planning permission to the designs by Healy & Partners in June 2010 and construction began in October of that year. It was not the first of Corr & McCormick's school to be demolished - that was St Patrick's Primary School (accommodated 900 pupils) at Pennyburn, Derry which opened in 1954 and demolished in 2002.